NeoCon launched at a crucial point in commercial design history. By the late ’60s office-centric design had arrived, and with it, an obvious need for industry standards and uniformity. The event shined a light on these issues and spawned professional associations, such as American Society of Interior Designers (ASID) and Business and Institutional Furniture Manufacturers Association (BIFMA), that continue to help regulate, promote, and support contract furniture and the interior design community. Each year since its origination, legendary minds have tackled the pressing issues of the time as speakers on NeoCon’s show stage. The energy crisis suffered by industrial countries in the 1970s led to discussions on the importance of conservation in design. Likewise, the advent of computers in the 1980s precipitated a design overhaul and a subsequent focus on ergonomics and intuitive design. 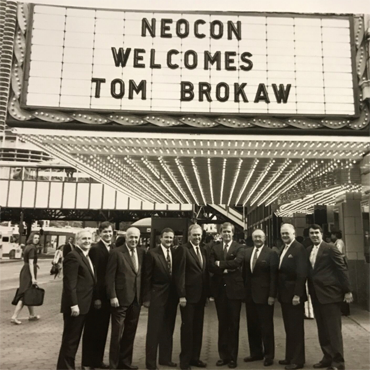 In every case, NeoCon has been the definitive platform for innovative products, new ideas, influential voices, and a vital meeting place for the industry. As the decades progressed, versatility, inclusivity, and corporate responsibility took precedence in design. When the Great Recession of 2008 hit, the concept of the workplace was turned on its head by a generation that decided life in the digital milieu equaled a chance to create tech-happy start-ups and non-traditional office culture. Wellness, social consciousness, and a search for work/life balance became the norm, along with the mobile worker and offices designed for comfort. Customization, materiality, and uniqueness now take priority over standard commercial space solutions. 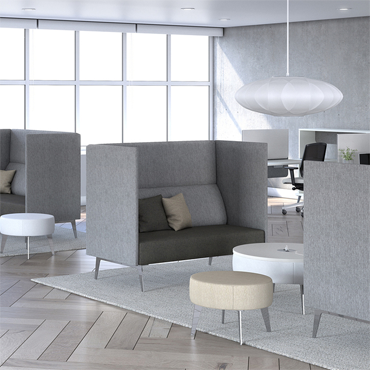 Looking ahead, workplace design will continue to evolve, even as big data and smart technologies drive new modes of office planning. Human well-being is emerging as a new benchmark for design, as is inclusivity for people of all abilities, genders, and ages. And that begs the question: what will the office of 2069 look like? No one can say for sure. Ultimately, one thing is for certain, the truth will be revealed on the floors of NeoCon in the decades to come. NeoCon is open to trade, media, C-Suite executives, and other industry-related professionals. CEU seminars are $60 when registered online by June 8; onsite registration is $70. Marquee/Keynote presentations are free; registration is required. NeoCon press registration for credentialed media is available online at www.neocon.com. Media can find additional details and images here. 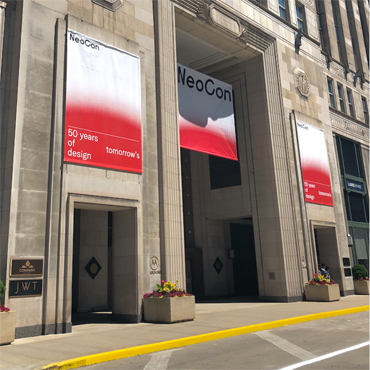 For showroom, exhibitor and general NeoCon news, images and real-time information, follow NeoCon Shows on the following social media channels: Facebook (@NeoConShows), Twitter (@NeoCon_Shows), and Instagram (@NeoCon_Shows).